As a small business owner, you’re the last line of defense for everything. If your employee doesn’t follow through, it’s your fault. If your taxes aren’t filed correctly, it’s your fault. If payroll is missed–you guessed it–it’s your fault. At Quick Draw Payroll, we understand what it takes to run a small business. We’re also aware that small business accounting services will help you elevate your business to the next level. You’ll be able to spend more time building your business instead of worrying if your employees got paid or your taxes were filed correctly. We’ve put together the top three benefits to hiring a professional small business accountant to help you save time and money while building your business. Whether you realize it or not, it takes time to complete your own accounting. It means the time you spend on your own accounting is less time you can spend winning more customers, closing deals, or growing your business. In the long run, hiring a small business accountant will save your time for more important aspects of your business like reducing your bottom line and raising your top line. You don’t need to be shuffling paperwork or balancing a book. You need to be out spreading your brand and increasing awareness around your services or products. Tax efficiency is crucial in reducing tax liability and saving you money when it comes to paying in your portion to the government. Whether you file as a sole proprietor or a limited liability company matters, and your professional accountant can help you decide which is best for your small business. You’ll want to avoid penalties or fines when it comes to taxes, too. A professional small business accountant will help you stay on top of the necessary paperwork to avoid paying an unnecessary fee if you’d simply filled out the document correctly. If you submit late, submit incorrectly, or don’t submit at all, you will incur penalties or fines that could slow your business growth or sink your business entirely. Let Quick Draw Payroll keep your business growing. Give us a call today! What if you could grow your business faster? Once you’re spending less time on paperwork and your accounting responsibilities are taken care of, you can focus more on growing your business. Whether it be research and development, hiring, or quality control, you will have more time to fulfill your other business responsibilities. 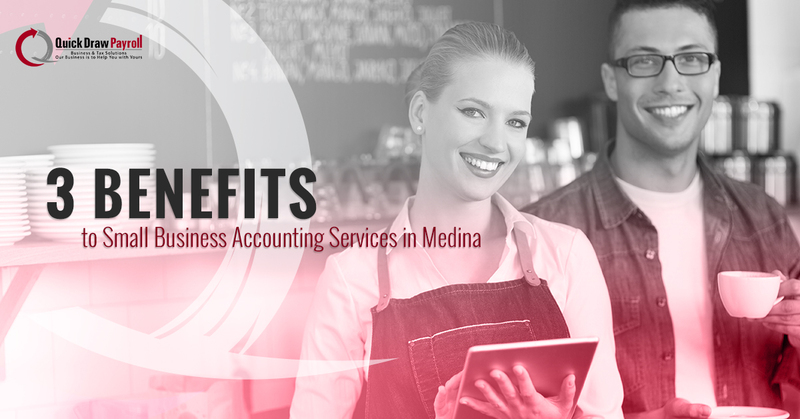 After nearly two decades of serving Medina with small business accounting services, our team at Quick Draw Payroll understand the challenges of owning and operating a business. Our clients trust us with their books so they can go grow their business and succeed. Whether you need simple accounting services or a selection of our business services, we will help! Give us a call today to get started! The small business I work for is wondering if it would be worth it to hire an accounting service to help with their financials. So thanks for mentioning that you by hiring a small business accounting service you will be able to spend more of your time winning customers. Since my boss loves new customers, I'll be sure to tell him that he should hire a service to help with our financials.